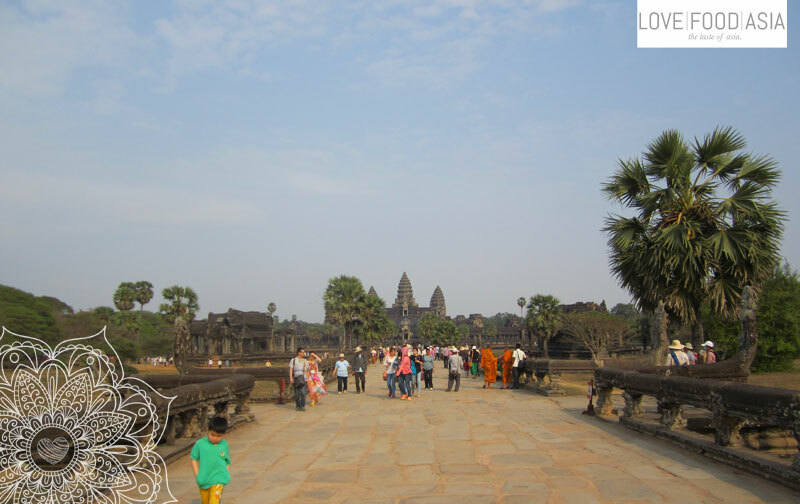 In all travel guides you can buy the temple area of Angkor is one of the top highlights. And now I´m one step away from entering the large area. The night bus arrived early this morning and I stepped out in Siem Reap to search a place to sleep. It is easy to find hostels here in this touristic city. I found a hostel on the outside of the city center. Cheap and clean. And there was a pool on the main floor. After I´ve left my backpack in my bed I walked down the street to rent a mountain bike. It is an 8 km ride from the city center to the temple area. Before I reached the city boundary I found a street food stall next to the road and I had a super delicious Khmer soup there. The locals were surprised and it seems that not may foreigners having a meal here. I reached the checkpoint where you have to pay an entrance fee. It was crowed and I felt small between all the cars and busses standing in line to enter the area. After the checkpoint it wasn´t crowded at all. Only at Angkor Wat it is always packed. When you go there to see the sunset or sunrise it is even more crowded. But that’s not surprising when you’ve seen this temple. I was to late to see the sunrise but seeing the sunset was possible. With a temple map in my hand I drove from temple to temple. At the end it was an 10 hours bicycle trip in Angkor. I was surprised that I wasn´t tired of seeing temples at the end. It was a cloudy day and it was impossible to shoot good pictures with my little compact camera. In between I felt like Indiana Jones while I was at the Ta Prohm temple. But this was just one of many highlights. Of course Angkor Wat was another. It is so amazing to see what the Khmer have built thousands of years ago. More highlights of my day where the Bayon temple and the Benga Mealea. Tomorrow I will start another tour. There are much more temples waiting form me. Now I will jump into the pool to relax my tired feet.